www.cementamericas.com • Winter 2018 • CEMENT AMERICAS 13 ry and legislative initiatives, including greenhouse gas emissions and other significant issues that impact cement manufacturing operations. He serves on a variety of PCA committees, includ- ing the Energy and Environment Com- mittee and Government Affairs Coun- cil. Award finalists were Hamid Farzam, vice president of technical services and quality assurance for Cemex USA and Steve Regis, senior vice president of corporate services for CalPortland. Market Development – Matthew Wood, sustainable products and pro- motion manager, Ash Grove Cement. Wood has distinguished himself for promotion of cement-based products at the national and local level, such as roller-compacted concrete and full- depth reclamation paving solutions. A member of PCA's Sustainable Develop- ment Committee and LEED Accredited Professional, Wood is a highly valued and credible voice for the industry's sustainability efforts. Award finalists were David Gray, market manager for GCC of America and Larry Rowland, manager of marketing and technical services for Lehigh Hanson. Young Leaders – Ruben Guerrero Jr., director of corporate affairs, Salt River Materials Group. Guerrero is active- ly engaged in PCA's network of public policy and communications commit- tees, including the Government Affairs Council, Industry Communications Committee and State Government Affairs Task Force. He has demonstrat- ed leadership by helping the industry navigate important issues affecting the business of making cement – from leg- islative and regulatory policy affecting a single plant to managing public per- ception about the industry as a whole. Award finalists were Desirea Haggard, environmental manager, CalPortland and William Kissel, senior environmen- tal manager, Titan America. The awards are named for John P. Glea- son Jr., who was PCA president from 1986 until his retirement in 2007, and known for consensus building within the association membership and allied organizations. "Jay embodied the spirit of leadership. 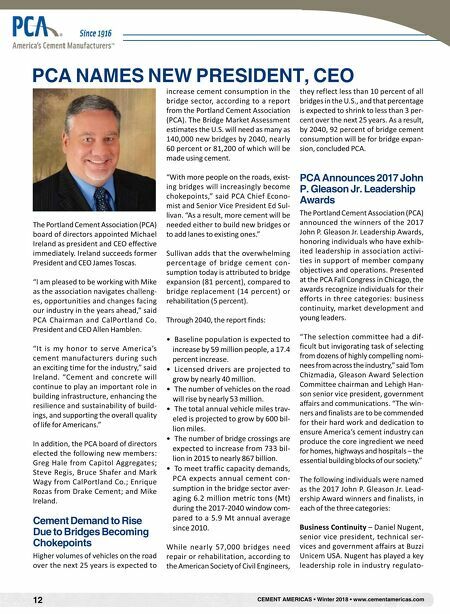 He was a strong manager and brought a true passion to the job," said PCA Chair- man and CalPortland President and CEO Allen Hamblen. "The awards given in his honor recognize individuals with that same spirit and who are important to our association and our industry." 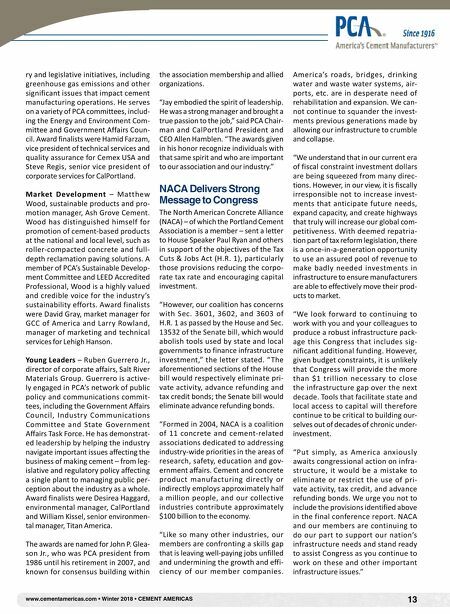 NACA Delivers Strong Message to Congress The North American Concrete Alliance (NACA) – of which the Portland Cement Association is a member – sent a letter to House Speaker Paul Ryan and others in support of the objectives of the Tax Cuts & Jobs Act (H.R. 1), particularly those provisions reducing the corpo- rate tax rate and encouraging capital investment. "However, our coalition has concerns with Sec. 3601, 3602, and 3603 of H.R. 1 as passed by the House and Sec. 13532 of the Senate bill, which would abolish tools used by state and local governments to finance infrastructure investment," the letter stated. " The aforementioned sections of the House bill would respectively eliminate pri- vate activity, advance refunding and tax credit bonds; the Senate bill would eliminate advance refunding bonds. "Formed in 2004, NACA is a coalition of 11 concrete and cement-related associations dedicated to addressing industry-wide priorities in the areas of research, safety, education and gov- ernment affairs. Cement and concrete product manufacturing directly or indirectly employs approximately half a million people, and our collective industries contribute approximately $100 billion to the economy. "Like so many other industries, our members are confronting a skills gap that is leaving well-paying jobs unfilled and undermining the growth and effi- ciency of our member companies. America's roads, bridges, drinking water and waste water systems, air- ports, etc. are in desperate need of rehabilitation and expansion. We can- not continue to squander the invest- ments previous generations made by allowing our infrastructure to crumble and collapse. "We understand that in our current era of fiscal constraint investment dollars are being squeezed from many direc- tions. However, in our view, it is fiscally irresponsible not to increase invest- ments that anticipate future needs, expand capacity, and create highways that truly will increase our global com- petitiveness. With deemed repatria- tion part of tax reform legislation, there is a once-in-a-generation opportunity to use an assured pool of revenue to make badly needed investments in infrastructure to ensure manufacturers are able to effectively move their prod- ucts to market. "We look forward to continuing to work with you and your colleagues to produce a robust infrastructure pack- age this Congress that includes sig- nificant additional funding. However, given budget constraints, it is unlikely that Congress will provide the more than $1 trillion necessary to close the infrastructure gap over the next decade. Tools that facilitate state and local access to capital will therefore continue to be critical to building our- selves out of decades of chronic under- investment. "Put simply, as America anxiously awaits congressional action on infra- structure, it would be a mistake to eliminate or restrict the use of pri- vate activity, tax credit, and advance refunding bonds. We urge you not to include the provisions identified above in the final conference report. NACA and our members are continuing to do our part to support our nation's infrastructure needs and stand ready to assist Congress as you continue to work on these and other important infrastructure issues."